After a longer-than-intended break from blog updates, I hope to be able to say that I am back on the path to more regular posts, but we shall see if I actually hold true to that. Before I jump into my latest projects, I would like to provide a few excuses. First, it's summer! I love summer, and it always keeps me busy, busy with fun trips, warm weather, etc. And this summer has been particularly full...bachelorette parties, showers, etc. 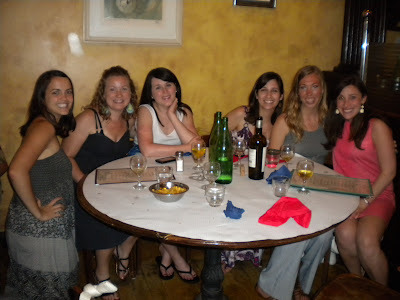 My awesome friends visited me in DC for bachelorette party fun. I received awesome homewares at my bridal shower in Tennessee in July. Michael and I excitedly (/awkwardly) opened gifts at our coed shower in Tennessee in July. Second, my projects of late have mostly focused on gifts for bridesmaids and groomsmen, so those must remain top secret (with one exception...see below). I was actually reading a little article on The Knot the other day entitled "Wedding Planning Basics: 10 Biggest Wedding Planning Blunders to Avoid." When I reached #7, I just had to laugh: Telling Everyone About Your Wedding. Oops. Oh, well. Third, our computer has just about pooped out. It is so full that Michael has forbade me from adding any more pictures to the computer, so this has really been a thorn in my blogging side. Without further ado, there is one bridesmaid gift project that I am able to share prior to the wedding. As I've discussed previously, I have asked each of my bridesmaids to wear a blue dress of their choosing so that they can each express their own sense of style with no stipulations regarding shoes, jewelry, hair, etc. Well, wouldn't you know, my egomania got the better of me, and I decided that I just had to force them to wear something that expresses my sense of style (plus, I just thought it fun/appropriate to make them something to wear since I'm also making the groomsmen something to wear). In the end, I decided that fascinators would be just the thing to infuse a little of me into them. Don't worry. No surprises have been ruined. I thought it might be a little rude to just pop this mandatory accessory on the ladies the night before the wedding, so I've already shared these pictures with them so that they can think about how they might want to wear their hair. You were awkward opening preseNts! Haha!! I loved the shower and some "face" time. And I am glad you showed a pic bc I had no idea what a fasci-whatever was!